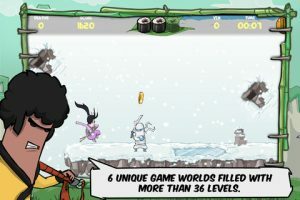 With a slick comicbook feel, fun environments, and cool character designs, Kinito Ninja may just be your new favorite iPhone game. 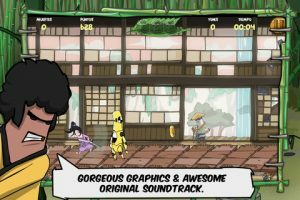 A retro side-scroller, Kinito Ninja is a manic, tap-happy runner set in a quasi-Japanese landscape. 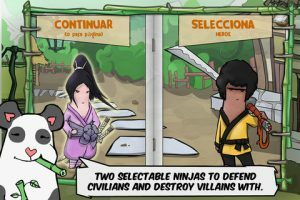 With 60 unique levels to master, two different characters, and six worlds to traverse, Kinito Ninja is a must-play. The controls are simple: tap or double tap the top left quadrant of the screen to jump or double jump. 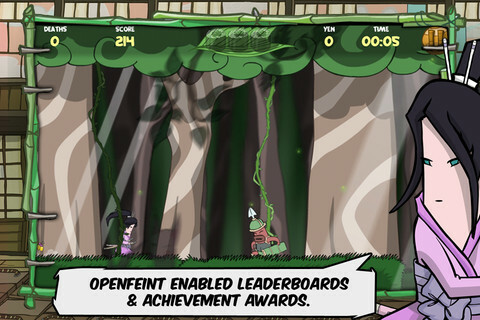 Tap or hold your finger on the lower left corner of the screen to slide under obstacles in your way. 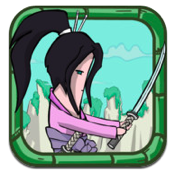 Tap the lower right side of the screen to attack enemies as you run, or tap the top right to destroy large clusters of enemies clogging your path. And as you go, make sure to collect all the sushi you see. After all, a ninja’s gotta keep their strength up. The only drawback of the control system is that you need to be really precise about where you tap: place your finger in between two quadrants of the screen by accident, and you’ll likely do the wrong action on the screen. With gorgeous graphics and an awesome original soundtrack, Kinito Ninja is the total package. There’s also a Lite version of the game you can sample before you try out the full version. But based on our experience, we’re sure you’ll love this addictive runner just as much as we did. Kinito Ninja is compatible with iPhone, iPod touch, and iPad. Requires iOS 4.3 or later. A small expedite fee was paid by the developer to speed up the publication of this iPhone app review.